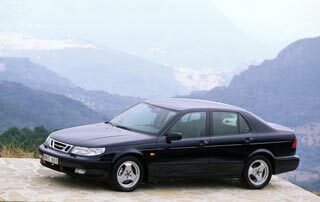 The all-new 9-5 series strengthened Saab's position in the mid-size premium segment by replacing the long-running 9000 with two distinct bodystyles, a sedan and a wagon. The sedan was launched in 1997 and the wagon - Saab's first since the 95 model in 1959 – came a year later. Both were penned by Saab’s Norwegian designer, Einar Hareide. Bold styling adopted design cues from the second-generation 900 model. The rising, wedge-shaped waistline, the 'hockey stick' line into the 'C'-pillars, the shape of the front lights and the oval door handles were all key Saab identifiers. The 9-5 also included a 'clamshell' hood, last seen in the 99/900 series. The sedan's coupé-like roof line and integrated boot-lid spoiler contributed to an excellent drag co-efficient of just 0.29, the lowest figure achieved at that time by Saab for a production car.